A bay window looking out on a spacious drive. Not an extraordinary view. If one is being sniffy one might point out that it is not one of the grand old English Houses. Bletchley, built after an older house was pulled down, just before the dawn of the nineteenth century, is a miss-mash of Victorian Gothic, Tudor and Dutch Baroque. It is a spring chicken compared to many of the great houses thereabouts. But it was to this room that Barbara Abernethy, personal assistant to the then head of the Government Code and Cipher School, Commander Denniston, was called, one chilly February night in 1941. It was in the teeth of the blackout, black as pitch, when four US Military personnel arrived and were ushered in. Barbara – who is recorded as having been intrigued but sworn to secrecy – poured each man a glass of sherry. Would Scotch have been more appropriate? Whatever the tipple, they were here to discuss a set of codes which had been intercepted between the Germans and the Japanese. Codes which concerned the Americans. It was many months before Pearl Harbour. This was Britain’s darkest hour, standing alone against the might of Nazi Germany. Darkest before the dawn, you might say; though I would argue, it was darkest before the dark. But in that room, they set the pattern. Intelligence would be a collaborative business from the moment the four left their sherry glasses and walked out of the meeting. And because of the close collaboration between America and Britain – whatever has happened since – the dawn did, finally, come. Stand in this space today, and it’s just another room. Except that to anyone who lived with those who went through that loneliest of stands, it isn’t. It’s a memory in bricks and mortar, remembered best when the dark closes round, and Autumn draws in. Posted in UncategorizedTagged bletchley park, code breaking, history, world war IIBookmark the permalink. I must visit Bletchley. It’s always held a fascination for me. Love the pictures of the room and the phone. Roger, it is a humble organisation; still utiltarian and sometimes ramshackle. But to me, it is filled with inventiveness, with the shadows of past great minds, and the enthusiasm of present ones. A special place. And fascinating time in history Kate! It was, Tandy. It must have been very hard not knowing whether there would be a happy ending. And following that collaboration, the Americans entered the war, my dad—a British soldier captured at Dunkirk—met an American named Doc in France at the end of the war as he made his way back to England, and Doc sponsored our immigration to America. A simple act one dark night, the start of a thread leading to the fabric of an individual life. A very significant room indeed. Jennifer, what a heart warming story! Your family’s story turned on this moment, in a strange way, too. Apparently it did, Kate. And thank you for telling the story. I’m sure many others were affected personally by the same meeting. When one thinks about the momentous things that took place in that pleasant room, it does give one a frisson. I heard that Bletchley was endangered – I hope that isn’t true. Oh, good. It seems to be out of danger. 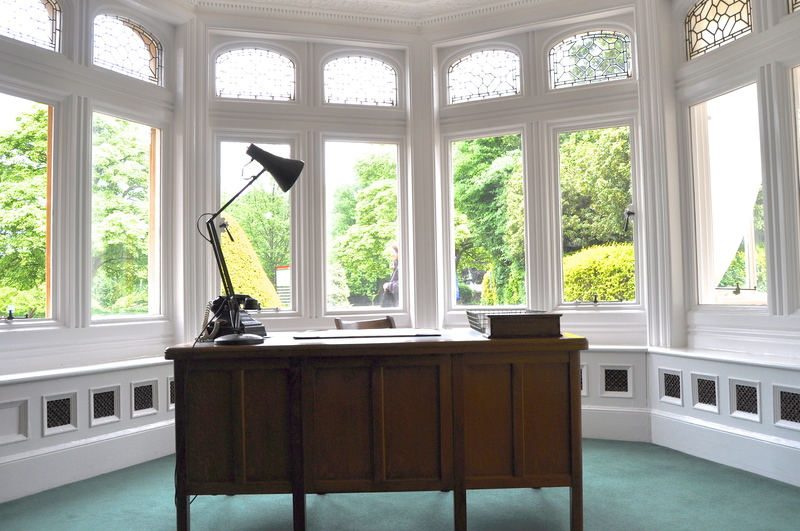 I would love to have my writing desk situated with windows surrounding it (and me). That’s a lovely place. But it has harrowing memories. If only the walls could talk. Quite, Gale. These code breakers did not know the end of the story. For all they knew, the place could have been in the hands of the Nazis within just a few short years of the meeting I have written about today. The stress must have been incredible: but living life on the edge does add a certain frisson. Many found peacetime incredibly tame in comparison. Kate, you brought goose bumps with this, which is surely what I would be feeling standing there in that room. There is so much more we are learning about the code breakers now and their effort in bringing forth the dawn. I am almost through with “Code Name Verity”. Having trouble putting it down. That is definitely one room in a mansion I’d like to visit, Kate. When I’ve visited FDR’s hideaway, Top Cottage in Hyde Park,I think about all the history packed within those walls and on the surrounding grounds. I wish there was a time traveling cellphone app so one could observe what history looks like when it’s in the making. Maybe it will be available on the iPhone87. I’m all for collaborative intelligence. Fantastic, Kate. What a gorgeous room, and this is one where I really do feel the sense of “if walls could talk.” What came to mind was how significant moments in history, precisely like this one particular collaboration, have set our leaders and governments in a solid allied relationship that has followed since through many conflicts. I think there are times when these relationships have caused other ripples, but there is a trust that feels solid and in a world as volatile as we know it to be, those deep friendships are reliable and necessary. I love the words you used, “darkest before the dark.” Seems so accurate to me. I always feel like you are taking me on a history tour from the comfort of my armchair. I love it! Bletchley was so interesting, I went there last spring with a group of cryptographers celebrating Alan Turing, what an immense effort the Enigma operation was! Kate, I was intrigued by your mention of British and U.S. Military meeting “to discuss a set of codes which had been intercepted between the Germans and the Japanese. Codes which concerned the Americans. Oh, Judy, how fascinating! The meeting has only come to light, I would imagine, since the time lapse of the Official Secrets legislation relating to the Second World War code breakers. Many of the heroes of the place never knew the fame they should have known because of the Official Secrets Act. And it sounds to me like your professor would have had to acknowledge publicly that you were correct, had this meeting been open knowledge at the time of your course. I took the course in the 1960s. I realize that many historic events and records don’t get the public airing until 50 or more years later.